Is there a risk to taking Fosamax® and other bisphosphonates when preparing for surgery? My dentist recently told me that because I have been taking Fosamax® therapy for osteoporosis that I had to wait three months before being able to have surgery. I have been taking bisphosphonates for approximately five years. Is this something that is true or is it over cautious? Your dentist is concerned about the potential for you having osteonecrosis (literally bone death). Precautions for elective surgery are now recommended for those who have taken Fosamax® for more than three years although the risk of osteonecrosis is very small. Fosamax® is the brand name of alendronate. 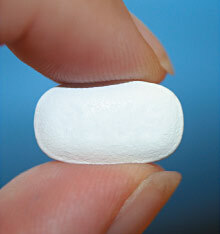 It is one of a group of drugs called bisphosphonates. Our understanding of bisphosphonates is evolving and it is certainly not an exact science presently. What we do know is that bisphosphonates are not metabolized quickly in the body, but stay within the bone tissue for many years. If any type of treatment is planned which involves surgery to the jaw bone, there is a risk that osteonecrosis may develop if the precaution of stopping the drug and waiting for a three month period is not taken. The cause of this condition is not fully understood. The general mechanism appears to involve a compromise of the blood supply to the bone. There are risk factors that make an individual more vulnerable to developing osteonecrosis; they include, but are not limited to, corticosteroid use, diabetes, alcohol abuse, tobacco use, infections and inflammation. The increase in concern is that bisphosphonates may be associated with a form of osteonecrosis that is specific to the jaws. Over the past few years there have been a growing number of cases reported. Osteonecrosis of the jaw may result from trauma in patients taking biphosphonates. Most case reports have occurred after dental extraction, but can also occur spontaneously and may be associated with pain at the site. The cause of the condition is not defined and may include the possibility of bisphosphonates altering the formation of blood vessels or bone micro-architecture. For patients on oral bisphosphonate medications, initial studies seem to indicate that three years of therapy makes patients more vulnerable. Most cases of osteonecrosis of the jaw appear to occur in patients who have been on intravenous bisphosphonate infusions, as part of treatment for cancer. The reported incidence in patients receiving intravenous bisphosphonates is 0.8% to 12%. The reported incidence in patients on oral bisphosphonates, such as Fosamax® is much less, 0.01% to 0.04%. Following teeth extractions, the incidence increases, but is still small, 0.09% to 0.34%. The optimum duration of bisphosphonate treatment has not been defined and studies are investigating long term dosing regimens to determine the best utilization of this drug. For patients on oral bisphosphonate medications, initial studies seem to indicate that three years of therapy makes patients more vulnerable. Studies that have gone up to two years in duration have not shown any adverse effect. These studies also suggest that stopping a bisphosphonate for 3 months prior to a procedure seems to reduce the incidence of osteonecrosis. It is puzzling that some bisphosphonate treatment may be associated with osteonecrosis of the jaw where as other bisphosphonates have been used to treat similar conditions, for example, avascular necrosis (loss of blood vessels resulting in bone death) of the hip. This suggests that further research is necessary to understand the cause of osteonecrosis. The websites of the American Dental Association (www.ada.org) or the American Association of Oral & Maxillofacial Surgeons (www.aaoms.org) may also provide useful information on this topic.